Inspired by the Jones H-bars I got this so-called "loop bar" for a fraction of the price (about 15 euro). It is a big improvement over the almost straight flat bars that came with the bicycle, and also at 600 mm they are a lot less wide, which better matches my shoulder width. The handlebar has 18 degrees backsweep , which is a bit more than I am used to, but it did not take long to adjust. With the ergonomic Ergon grips it feels great. The shape allows for some serious backsweep without bringing the grips closer to the rider, which means you don't need a longer stem when switching from a straight(er) bar. The handlebar has a rise of 60 mm which is quite significant, which I needed. 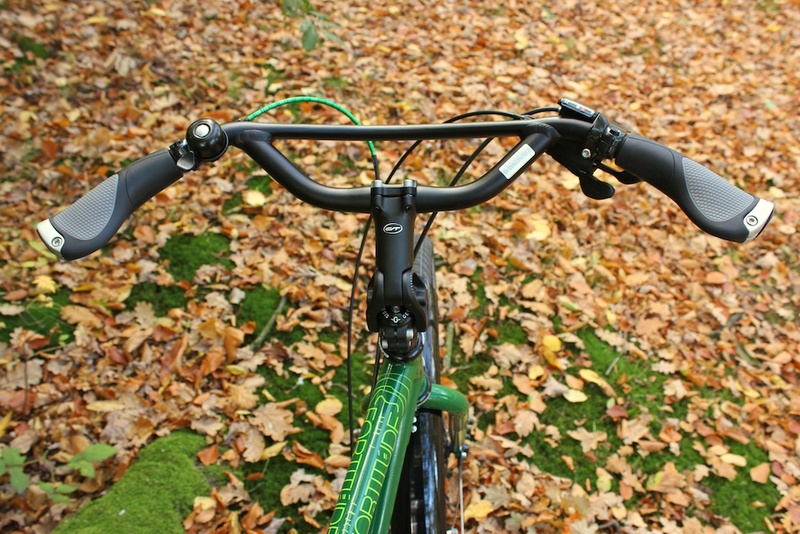 The handlebar was mounted using an adjustable stem. The ability to adjust the height and position of the handlebar while on the road can be very handy when you have not found your optimal position yet. One of the key features of this handlebar is the middle bar that allows more space to put your hands on while your wrists rest on the bottom bar. The bar is ovalized for a more comfortable grip and curved downward which is hard to see in pictures. It is however less suited for mounting accessories like a light or handlebar bags. It might require modifying some mounts to make them fit. If you want to mount a handlebar bag I would recommend you take a look at the Ergotec Space. The grip length is relatively short at only 165 mm because of the middle bar. With the bell, shifter, brake levers and grips on there, there is no space to add any bar ends. The only solution would be grips with integrated bar ends. Ergotec Boomerang handlebar on my bicycle with adjustable stem and Ergon GP1 grips. Aside from extra grip space the bars also provide extra possibilities I was also interested in using it for carrying luggage there. After playing around with it, it did not seem very convenient, and did not pursue it any further. The handlebar is made out of quite thick aluminum, three different kinds of handlebar plugs/covers did not fit in there, only the one from Ergon were able to go in there with some force. I have also successfully added a tribar to this handlebar to add more grip positions. I had to disasemble the arm rests to make it fiot through the Boomerang's loop but it does fit nicely. After using the Ergotec Boomerang for 6 months I am relatively pleased with it. I like the 60 mm rise, and the 18 degrees backsweep, it also the right width for my shoulders. The middle bar does not give me the extra space for extra hand positions or mounting accessoires that I thought it would. Most things don't fit the flattend or curved parts very well. It's a nice handlebar for the price, but it does not add as much versatility as an original Jones H-Bar does.